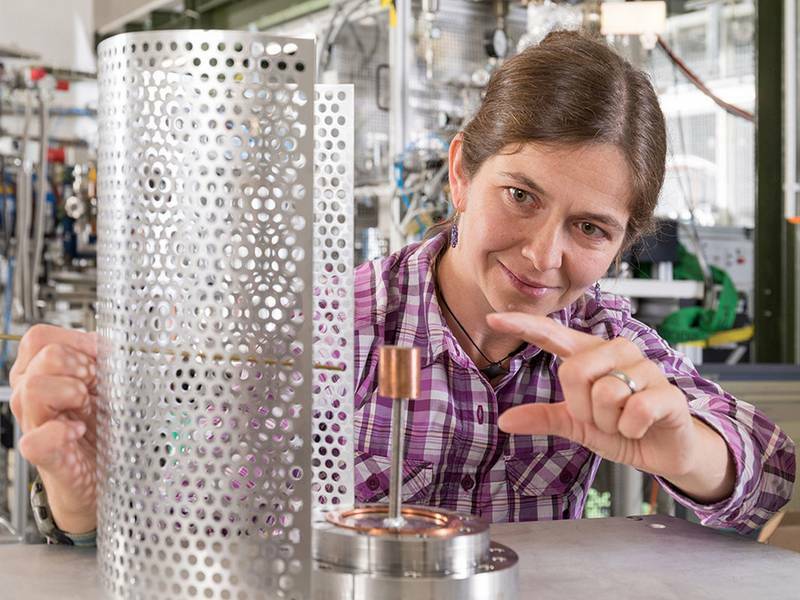 For the first time, scientists from the Technical University of Munich (TUM) and the Max Planck Institute for Plasma Physics (IPP) have succeeded in losslessly guiding positrons, the antiparticles of electrons, into a magnetic field trap. This is an important step towards creating a matter-antimatter plasma of electrons and positrons, like the plasmas believed to occur near neutron stars and black holes. In an interview, Dr. Eve Stenson presents her research work. Why do you want to lure positrons into a trap? Being able to capture and confine positrons is fundamental for studying what is known as electron-positron pair plasma. Such plasmas are of great interest both for the investigation of fundamental questions in plasma physics as well as in astrophysics. What is so difficult about catching positrons? Positrons are the antiparticles of electrons, they have the same properties except that they are positively instead of negatively charged. When a positron hits an electron, both instantly annihilate in a flash of light. And since there are electrons in abundance everywhere on Earth, it is extremely difficult to store positrons in such a way that they survive for at least a while. Fortunately, we have the most powerful positron source in the world, NEPOMUC (neutron induced positron source Munich), here in Garching, north of Munich, at the Research-Neutronsource Heinz Maier-Leibnitz (FRM II). It can produce 900 million positrons per second. Plasma physicists have been simulating this electron-positron plasma for 40 years. You have now come a decisive step closer to achieving it in practice. How did you do that? It is actually very difficult to guide charged particles such as the positive positrons into a magnetic trap. The same rules of physics that confine the particles inside this trap unfortunately also keep out the particles that are supposed to enter. Our trap has a magnetic field very similar to that of the Earth or other celestial bodies. We came up with the idea of briefly applying an electrical voltage to the edge of the trap to guide the positrons through the magnetic “bars”. When we then switch the voltage off again, the positrons remain trapped in the cage. It worked so well, even we were surprised. How long have you been able to confine the positrons? ... for a little more than a second. No group in the world has yet succeeded in doing this with antimatter in this type of trap. What are the benefits of the results for plasma physics or other areas? 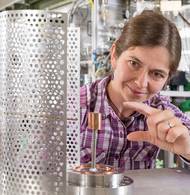 The aim of the APEX (A Positron-Electron Experiment) Group at the Max Planck Institute for Plasma Physics is to produce a matter-antimatter plasma of electrons and positrons and to confine that plasma in a magnetic cage. 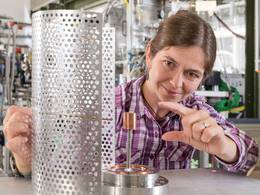 The first step, however, is to be able to produce and store enough positrons. The next step is to actually create and examine such plasmas. Astrophysics assume that such exotic plasmas occur in the vicinity of neutron stars and black holes. In terrestrial plasma physics, the symmetry of positron and electron masses is expected to lead to new findings on waves and turbulence in plasmas – findings that could help us to use nuclear fusion for power generation in the future. Lossless Positron Injection into a Magnetic Dipole Trap. Confinement of Positrons Exceeding 1 s in a Supported Magnetic Dipole Trap. Partner in the project were the Technical University of Munich (Germany), the Max Planck Institute for Plasma Physics, Garching and Greifswald (Germany), the Leibniz Institute of Surface Engineering (IOM), Leipzig (Germany), University of Greifswald (Germany), the University of Tokyo (Japan), University of California, San Diego (USA) and the Lawrence University, Appleton (USA). This project has received funding from the European Research Council (ERC), the German Research Foundation (DFG), the Helmholtz Association Postdoc Program, the UC San Diego Foundation, the Collaboration Research Program of the Japan National Institute for Fusion Science (NIFS) and the Japan Society for the Promotion of Science (JSPS).